The first month with only a monthly shop (and top up veggies) is over and it was surprisingly easy. Just goes to show what a little planning can achieve. The month's grocery spend was quite high in the end (about $700) but I put that down to having to do a major re-stock after the no-spend month. I'm confident I can keep the grocery budget to about $600 a month from now on, which is a pretty drastic improvement on the previous average spend of over $1000 a month. Well, that's what I thought our average grocery spend was, but it turns out that I was only looking at the previous 3 months of spending. This week I did a full 2015-2016 spending analysis by exporting all our data from our online banking system which has a budgeting function allowing each spend to be allocated to a category. This makes ongoing tracking nice and easy and allows for relatively quick and easy analysis (using pivot tables in Excel - the geek in me is coming out!). What I was shocked to find was that the three months prior to no-spend month were actually an anomaly! 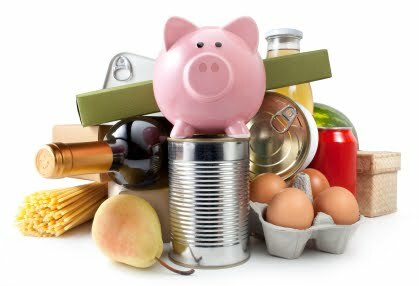 Our grocery spend across the financial year had increased very quickly from $550 last July to averaging $1100 per month from November! So what happened? I think 'Hello Fresh' boxes had a lot to do with it. I got sucked in by the half-price first couple of boxes and the convenience and excitement of trying new recipes each week. But I was also getting the usual CERES fruit and veg box each week as well as spending a lot of time popping into Coles for a few things here and there. My baby also started on solids at around this time and she loves her food! I also think that getting into the rhythm of not working and being at home with the kids affected my shopping. At a time when I should have been becoming extra frugal due to the one income situation, I was popping to the shops on a regular basis as an outing. The shops are a 10 minute walk and there is a park on the way, so this was the perfect way to get out of the house and get among people and give the kids a run-around. The silly thing is that I can go to the park (and library which is near the shops) and not spend any money! Now I walk through the shopping centre on my way to the library to get my 'getting among people' fix, and do my best not to buy anything except the odd loaf of bread. So now that I feel the grocery spend is under control, and the 'food and dining' (read cafe) spend has been drastically reduced too (although still way too high...) the next step in saving our budget is cutting 'fixed' expenses, like insurance premiums and utility bills. This is something I have been putting off for a very long time, as I can think of nothing worse than sitting on the phone getting insurance quotes, but I know that I can do better, particularly with our car insurance. So stay tuned!